A tiny British island has witnessed a rare natural phenomenon - a vortex of thousands of tiny puffins. Skokholm island off Pembrokeshire had the awe-inspiring sight of more than 7,500 puffins arriving at the island in just minutes - the highest number ever recorded in March. The little birds were joined by other arrivals including thousands of Auks, a family of the bird species that includes murres, guillemots, auklets, puffins, and murrelets. A spokesman for Skokholm Island said: 'Over 7,300 Puffins today including our first ashore. Highest March count since the 1950s. 'This afternoon's spectacular Puffin vortex resulted in their earliest landfall in 90 years of recording on Skokholm. 'The puffins came in with a bang yesterday so we walked the whole coastline and counted them. 'A mighty 7,447 were rafting just below the cliffs; an amazing count and the highest March count ever. 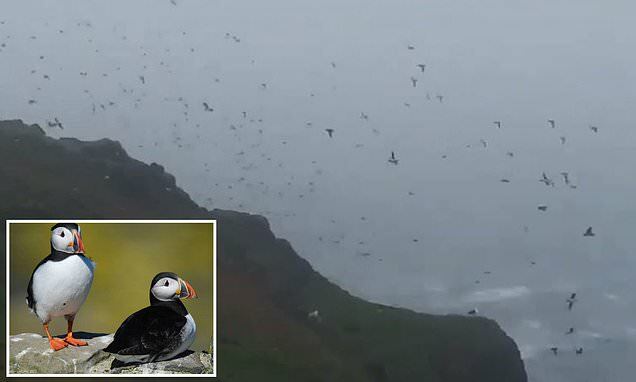 The Wildlife Trust of South and West Wales which manages Skokholm and Skomer islands confirmed that by Tuesday there were over 7,500 at Skokholm and over 5,000 at Skomer.